The vital objective of this report is to analysis Customer Satisfaction of BASIC Bank Limited. Other objectives of this reports are to know whether the customers are satisfied, to find out the causes of dissatisfaction and to do Face-to-face conversation with clients visited the branch and then prepared the questionnaire to collect to know the customer satisfaction level of BASIC Bank. Finally this report make swot analysis Customer Satisfaction of BASIC Bank Limited. The Bank of Bangladesh Small Industries & Commerce Limited (BASIC) established as Banking Company under the Companies Act 1993 launched its operation January 21, 1989. At the outset, the Bank started as a joint venture enterprise of the Bangladesh Credit Commerce (BCC) foundation with 70 percent shares and Government of Bangladesh (GOB) with the remaining 30 percent shares. The BCC Foundation being non functional following the closure of the BCCI, the Government of Bangladesh took over 100 percent ownership of the Bank on 4 June, 1992. The bank was established as the policy makers of the country felt the urgency for a bank in the private sector for financing Small scale Industries (SSI).BASIC is unique in its objectives. It is a blend of development and Commercial Banks. The memorandum and Articles of Association of the Bank stipulate that 50% of Loan able funds shall be invested in Small and Cottage industries Sector. Bangladesh Small Industries and Commerce Bank Limited, popularly known as BASIC Bank, are state-owned. However, it is not a nationalized Bank. It is a bank-company and operates on the lines of a private bank. The very name Bangladesh Small Industries and Commerce Bank Limited is indicative of the nature of the bank. It is a blend of development and commercial banks. The Memorandum and Articles of Association of the bank stipulate that 50 percent of loan able funds shall be invested in small and cottage industries sector. Thus the bank’s priority remains with promoting and financing development of small-scale industries in the country. According to Industrial Policy 1999, “Industry” is broadly defined to include both manufacturing and service sectors. “Manufacturing Industry” includes all production, processing, and assembling activities as well as repairing and reconditioning of processed goods. “Service Industry” includes those service-oriented activities, which involve significant use of equipment or fixed assets. Service Industry includes hotel, hospital, clinic, and IT based enterprises. “Small Industry” means enterprise employing fewer than 50 workers and / or with a fixed capital investment of less than Tk. 100 million. “Cottage Industry” covers household-based units operated mainly with family labor. Generally, fixed assets and operating costs together do not exceed more than Tk. 0.5 million per unit of cottage industry. 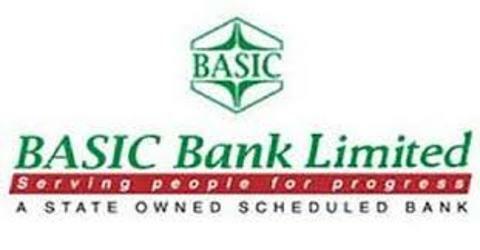 BASIC collects fund from deposits from the members of the public, borrowing and shareholders’ equity. Term Loans to industries especially to Small-Scale enterprise. Fully fledged commercial banking Service including collection of deposit, short term trade finance, Working capital finance in processing a manufacturing units and facilitating international trade. Micro Credit to the urban poor trough Linkage with NGOs with a view to facilitating their access to the formal financial market for the mobilization of resources. Financing & Technical support to Small Scale Industries (SSI) in order to enable them to run their enterprises successfully. Financing in import and export business like other commercial banks. General Banking facilities like CD, FDR, SB, STD, BCD, FCA etc. are available. Provides loans on easy terms and conditions. The bank invest it fund into profitable sector. The bank is doing the transaction of bill of exchange, Cheque etc. on behalf of the clients. BASIC Bank Ltd assists in the Foreign Exchange by issuing Letter of Credit. The bank insures the securities of valuable documents of clients. It brings the increasing power of dimension of transaction. Above all, BASIC Bank Limited helps the businessmen financially by giving discount facility for bill of exchange and by providing the facility of Letter of Guarantee. BASIC keeping pace with the changing environment. To corporate and collaborate with institutions entrusted with the responsibility of promoting and aiding SSI sector. Deep commitment to the society and growth of national economy. To search for newer avenues for investment and develop new products to suit such needs. The word “satisfied” itself had a number of different meanings for respondents, which can be split into the broad themes of contentment/happiness, relief, achieving aims, achieving aims and happy with outcome and the fact that they did not encounter any hassle: Many activities are there in this Bank whereas it provides many services in daily to the customer General Banking is the starting point of all banking operation. Everyday it receives deposit from the customer and collects cash by the check. So this section plays a very important role in attracting customer and therefore should be handled with extra care. There are many clients in the BASIC Bank. They are getting services from this section so if general banking performance is good then customer easily can have better service and become satisfied. So to hold the customer they have to provide the good services. Other sections are like Loan and advance and foreign exchange division. Many customers can take loan from this department. And also the departments have many procedures for taking loan. The foreign exchange department consists of export; import and other foreign remittance play an important role in a developing economy. The main cause of select the topic understands the different banking activities with the special customer satisfaction level. From this report I have tried to find out the customer satisfaction level that means how mush satisfied the customer of this bank. Finally come to findings and to provide some valuable recommendations for help out of the bank. We know that objective is important each and every work and without this is not possible to complete or finish the work that is meaningless. So to make a report I have some objectives also. Broad objectives: To understand the customer satisfaction of BASIC Bank customers concerning the affectivity of the banking activities of BASIC Bank. To give suggestions / solutions to solve those problems. The study focuses about the banking activities and satisfaction of the customer and can know the possible ways to improve the services. The scope of this report is limited to only this branch of Dhaka Metropolitan Area not whole BASIC Bank. To meet up our objectives, we surved 50 customers, On the basis of this survey we try to know the satisfaction of the customer of BASIC Bank limited. According to this table we can say that most of the customers are male that means 86% customer are male where as minimum customer are female that means only 14% customer are female. Table 1.1 data can be shown graphically. BASIC Bank has many clients. Every person’s occupations are different. That’s why the question was asked to identify different occupation of the respondent. Table 1.2 shows that out of 50 respondent maximum customers are Business man that means 58% customers are business man. Where as minimum customers are students that means only 4% customers are students. 22% customers are service holder and 8% customers are house wife. And the remaining 8% are others occupation. Table 1.2 data can be shown graphically. It means that duration of the account. The question was asked to identify duration of the account of the customer. Table 1.3 shows that out of 50 customer maximum customer have account for one year to less than two year that means 40% customers have account for one year to less than two year. Where as 28% customers have account for less than one year. The rest of the 32% customers have account for more than two year. Table 1.3 data can be shown graphically. It means that the accounts are not similar one with another. The question was asked to identify which account the customers have of this bank. Table 1.4 Shows that out of 50 customer’s maximum customers have current account that means 36% customers have current account. Where as minimum customer have fixed deposit accounts that means only 12% customers have fixed deposit account in this bank. 30% customer have savings account and remain 22% customer have others. Table 1.4 data can be shown graphically. Image of the bank means bank the reputation of the bank. . That’s why this question was asked to identify how many respondents choose this bank for image. Table 1.5 Shows that out of 50 customers maximum customers are agreed to this statement that means 32% customers are agreed choose the bank for image. Where as minimum customers are strongly disagreed that means only 8% customers are strongly disagreed. 24% customers are strongly agreed and 20% customers are neutral. And the rest of 16% are Disagreed. Table 1.5 data can be shown graphically. Service quality means bank are providing the different services to the customer so how those service quality. That’s why this question was asked to identify how many respondents choose this bank for better service quality. Table 1.6 Shows that out of 50 customers maximum customers are agreed about this statement that means 38% customers are agreed choosing the bank for better service quality. Where as minimum customers are strongly disagreed that means only 6% customers are strongly disagreed. 28% customers are strongly agreed and 20% customers are neutral. And remain 8% customers are Disagreed. Table 1.6 data can be shown graphically. Table 1.7 Shows that out of 50 customer’s maximum customers are agreed about this statement that means 34% customers are agreed choosing the bank for lowest service charge. Where as minimum customers are strongly disagreed that means only 6% customers are strongly disagreed. 26% customers are neutral and 22% customers are strongly agreed. And the rest of the 12% customers are Disagreed. Table 1.7 data can be shown graphically. Advance technology means the technology which is updated and very fast. That’s why this question was asked to identify how many respondents prefer this bank for advance technology. Table 1.8 Shows that out of 50 customer’s maximum customers are neutral about this statement that means 30% customers are neutral for advance technology. Where as minimum customers are strongly disagreed that means only 10% customers are strongly disagreed. 24% customers are agreed and 22% customers are disagreed. And remain 14% customers are strongly agreed. Table 1.8 data can be shown graphically. Acceleration of transaction means the speed of transaction. Here the customer evaluate on the basis of the speed of transaction. That’s why this question was asked to identify how many respondents like this bank on the basis of acceleration of transaction. Table 1.9 shows that out of 50 customer’s considerable portion rated excellent.36% customers said excellent, where as minimum customers that means 8% customers rated as very bad. 24% customers rated as good and 22% customers rated as average. And remaining 10% customers rated as bad about acceleration of transaction. Table 1.9 data can be shown graphically. Expertise in solving the problem mean when the customers feel any problem in that time the problem is easily solved. That’s why this question was asked to identify how many respondents approximating this bank for expertise in solving the problem. Table 2.0 shows that out of 50 customer’s maximum customers rated as average. That means 38% customers said average about expertise in solving problem. Where as minimum customers rated as very bad that means only 2% customers rated as very bad. 24% customers rated as good and 16% customers rated as excellent. And remaining 20% customers rated bad about acceleration of transaction. Table 2.0 data can be shown graphically. Public relation and media information to the customer that mean gives the message to the customer through advertising by media. Table 2.1 shows that out of 50 customer’s maximum customers rated as very bad about this statement that means 52% customers said very bad about public relation and media information to the customer. Where as minimum customers said excellent that means only 2% customers rated as excellent. 26% customers rated as bad and 16% customers rated as average. And remaining 4% customers rated as good about public relation and media information to the customer. Table 2.1 data can be shown graphically. It means that hides information or do not pass the information to others. That’s why the question was asked to identify how many respondents prefer this bank for secrecy. Table 2.2 shows that out of 50 customer’s maximum customers rated as average about this statement that means 42% customers said average about secrecy in terms of transaction. Where as minimum customers said bad that means only 4% customers rated as bad. 38% customers rated as good and 10% customers rated as excellent. And remaining 6% customers rated as very bad about secrecy in terms of transaction. Table 2.2 data can be shown graphically. Automated Teller Machine (ATM) provides better services than to withdraw money by standing in a queue. Table 2.3 shows that out of 50 customer’s maximum customers rated as very bad about this statement that means 76% customers said very bad about ATM (VISA) or credit card facility. Where as minimum customers said average that means only 8% customers rated as average. And the rest 16% customers rated as bad about ATM (VISA) or credit card facility. Table 2.3 data can be shown graphically. This point is one of the most important points which customers pay a deep attention when they are going to open an account or another thing. Table 2.4 shows that out of 50 customer’s maximum customers rated as good about this statement that means 38% customers said good about charge of the bank. Where as minimum customers said very bad that means only 8% customers rated as very bad. 28% customers rated as average and 14% customers rated as bad. And remaining 12% customers rated as excellent. Table 2.4 data can be shown graphically. Table 2.5 shows that out of 50 customer’s maximum customers rated as good about this statement that means 56% customers said good about wide range of service. Where as minimum customers said very bad that means only 4% customers rated as very bad. 18% customers rated as excellent and 14% customers rated as average. And remaining 8% customers rated as bad. Table 2.5 data can be shown graphically. It means that relationship between Bank and the customer. That’s why the question was asked to identify how the relationship between bank and customer. Table 2.6 shows that out of 50 customer’s maximum customers are agreed about customer relationship management. That means 38% customers are agreed. Where as minimum customers are strongly disagreed that means 4% customer are strongly disagreed. 28% customers are strongly agreed and 24% customers are neutral. And the remaining 6% customers are disagreed. Table 2.6 data can be shown graphically. Table 2.7 shows that out of 50 customer’s maximum customers are agreed to this statement. That means 32% customers are agreed. Where as minimum customer are strongly disagreed that means only 6% customer are strongly disagreed. 28% customers are neutral and 24% customers are strongly agreed. And the remaining 10% customers are disagreed. Table 2.7 data can be shown graphically. The whole banking activities are regulated by the employees of the bank. The question was asked to identify how many respondents prefer employee’s behavior of this bank. Table 2.8 shows that out of 50 customer’s maximum customers are agreed about employee’s behavior. That means 58% customers are agreed. Where as minimum customer are disagreed and strongly disagreed that means only 2% customer are disagreed and strongly disagreed. 22% customers are strongly agreed. And the remaining 16% customers are neutral. Table 2.8 data can be shown graphically. Table 2.9 shows that out of 50 customer’s maximum customers are neutral about this statement. That means 38% customers are neutral where as minimum customer are strongly disagreed that means only 6% customer are strongly disagreed. 28% customers are agreed and 18% customers are strongly agreed. . And the remaining 10% customers are disagreed. Table 2.9 data can be shown graphically. Table 3.0 shows that out of 50 customer’s maximum customers are strongly agreed about this statement. That means 36% customers are strongly agreed where as minimum customer are strongly disagreed that means only 2% customers are strongly disagreed. 32%% customers are agreed and 26% customers are neutral. And the remaining 4% customers are disagreed. Table 3.0 data can be shown graphically. Table 3.1 shows that out of 50 customer’s maximum customers rated as good about this statement that means 52% customers said good about overall satisfaction level. Where as minimum customers said very poor that means only 4% customers rated as very poor. 22% customers rated as excellent and 16% customers rated as average. And remaining 6% customers rated as poor. Table 3.1 data can be shown graphically. It is impossible for me to find out every thing. I have found some sought of thing. There are some problems. Some problems relate to its own institutional weakness and some problems that are recognized by the customer. Interest rate is very low on savings account and fixed deposit account compare to other banks. BASIC Bank does not give any message through advertising about their various services in different TV channels, radio, newspapers etc. In some cases BASIC Bank follow the traditional banking system. There are few ATM booths in this bank. All of the branches are not associated with on line banking system. In rural areas there are not enough branches. BASIC Bank are not concerned about promotional activities. They do not provide loan like car loan, education loan, etc. The branches are not well computerized. Some activities are doing on the manually rather than computer. So it takes more time. They do not use the advance technology. Employees help to the customer willingly. Need more employees in some division but there are few employees in that division. Employees treat customer with respect. Acceleration of transaction is good. They don’t have right number of employee in some division. They take more time to open a new account. BASIC Bank doesn’t have any entertainment facility. Some times they take time to solve the problem. It is very difficult for me to recommend about BASIC Bank limited because I have been there only three months. So from my point of view I think that BASIC Bank can follow the steps. The BASIC bank limited should have used advanced technology such as intranet service, online system, task sharing, computerized documentation, and high tech software and so on. BASIC bank should introduce Management information system (MIS) system to mobilize its day to day activities. It will help the employee to do their work more quickly and at the same time maintaining their quality of work and also helps to work efficiently and effectively and get it enabled to provide services according to the customers’ needs and wants. Increase the interest rate to attract more customers and stop switching of the existing customers. Interest rate on savings deposit should be increased. Interest rate on fixed deposit should be increased. Because savings and fixed deposit interest rate is very low of BASIC Bank compare to other Bank. So the bank should increase the interest rate. BASIC Bank does not have that much ATM booth. People cannot withdraw money by any time based on their needs. So ATM booth should be increased in many places. BASIC Bank should give message through advertising about their various services in different TV channels, radio, newspapers etc. They should inform to the customer what their existing product is and up coming product. At present BASIC bank does not have credit card or debit card facility. So Credit card, Debit card facility should be established. They should give some sought of loan like car loan, education loan, etc to the customer. The bank should produce the required number of effective and efficient employee by the different type of training where the right person does the right job at the right time for banking benefits. Some division should assign right number of employee to do the banking activities smoothly. BASIC bank should use different types of marketing strategy for attracting customers. BASIC bank should provide to the customers quick service in order to open a new account. The bank should give optimum level of remuneration to the intern person for becoming them more rechargeable. BASIC bank should arrange some entertaining elements like, television or other visual elements which can make refresh to the customers while they waiting for withdraw money or other banking activities. BASIC Bank is unique in terms of constitution, its mandate, and its objectives and modus operand. The Bank is committed to being a sophisticated prominent and professional institution, providing a one window service to its customers. Through the bank has the mean time found its own special position in the sector at the higher rank of the self. BASIC bank is expected to continue to maintain strong competitive edge in banking sector in Bangladesh in the year ahead. Through bank’s specialization and integrated approach, the bank aims to build a strong position in the industrial development of Bangladesh. The bank also plans to maintain its focus on managing capital and costs to maximize shareholders value. In this environment the bank expects to make further gains in revenue, income and return on capital. As an internee in BASIC Bank Bangladesh Limited at karwan Bazar Branch I have learned many things and found some sought of things after analyzing. If management of this bank concentrate on this then it will be better. I think to pull the new customer and to hold the existing customer it is important. Then they successfully compete in the customer retention which will be better for this bank. So the bank must make a positive attempt to be more outward looking in their goals and aware what is happening. They must also emphasize on the domestic scenario more closely and analyze any strategies of their competitors. The bank must accept any failures and think of them as an objective to pursue future goals. Foreign Exchange Operations of Uttara Bank Limited.